With the majority of the best Category III output now seen by me, probably the most memorable director taking on this genre and rating is Billy Tang. When asked which is the most disturbing of this particular brand of Cat III films, I have to say Billy Tang's Dr. Lamb, because of the content in there (necrophilia being one). Pretty much every Cat III film is the same, flashback structure and a good dose of silly, out of place, comedy. However, Run And Kill has remained my favourite from this era for one big reason; it dared to be different. Most of the notorious Cat III films, through numerous reviews, take on an almost unreal level of nastiness but when I sat down to watch Run And Kill for the first time (this being my third) it was reconfirmed that the shock level was restricted to select moments. Billy Tang is the more darker minded director of Cat III and this tale verifies that. A tale of people operating on the flipside of Hong Kong society and we get to experience the consequences of the ordinary man's involvement. There certainly is a social critique by Tang here in regards to how nasty organized crime can be. Even if this isn't movie entertainment per say, it isn't a showcase for subtle social commentary either though. Billy Tang wants to take us on an relentless dark, funny journey and creates a genre classic with it. Tang's idea of structure for Run And Kill is not to let the audience in on what's coming during the next 90 minutes. In the only really broad comedy sequence we see the bliss of the Cheung family. Well, between father and daughter anyway since Tang establishes early the wife's distant connection to the rest of the family. She is soon seen being unfaithful which is the starting point of the dark side of the film. In terms of the character of Cheung, his experiences during the film is a harsh life lesson in itself. A lesson of discovery of inner strength and rage but also one that teaches you to take responsibility for your words and actions. While there's a strong sense of sympathy for Cheung, seeing as he's an upright citizen who made one fatal flaw, there is a small sense of Tang communicating the fact that you get what you deserve. It's an interesting and well realized journey, largely successful because of Kent Cheng's devotion to the character. It's both touching, as he acknowledges that he did love and respect his wife and darkly humerous as he can't seem to catch a break for one second during the film. Tang maintains a good flow to the film, not being terrific with tension but his created pessimistic Hong Kong in Run And Kill is a unique slice of cinema. The people Cheung accidentally enlists are not those who travels amongst the ordinary humans and most settings in the film are those on the backside of Hong Kong. Settings ranging from cramped environments such as the small flat of Cheung's, the disco pumping with dark industrial music to Mainland villages devoid of people. Director of photography Tony Mau (Dr. Lamb) effectively uses strong blues to transfer us to these settings. Cat III regular composer Jonathan Wong isn't credited and the score doesn't really have his industrial/synth-esque flavour but Run And Kill's tense score works as a basic but effective mood setter. In terms of gore, it's more subdued in a way. This doesn't belong to the horror genre and Billy Tang opts for gritty bloody violence that could pass for Cat IIb actually. What raises this to the famous Cat III level is particular through two sequences. One that, through effective rapid fire editing shows the ordered murder of Cheung's wife and one, now cult scene out of Hong Kong cinema, has Simon Yam executing a character in the most grisly way possible (very heated moment). On a technical level, there are some good make-up effects here, like close-ups of stabbings but the above mentioned talked about scene has always been talked about because of what it is, not necessarily how graphic it is. Run And Kill possesses a few narrative flaws that needs to be addressed. First, when the movie shifts locations to the Mainland, there is a few minutes of confusion for the viewer as the Mainland gang is introduced. No exposition is given so it takes a little bit for us to catch up on the fact that they're a rival gang out to help Cheung. The other flaw occurs at the climax where director Tang gets too caught up in the relentless assault of dark violence. It's the confrontation between Kent Cheng and Simon Yam that goes on way too long, turning Simon's character into a cross between Jack Nicholson in The Shining and The Terminator. Running time wasn't an issue and I'm sure the director could've cut this finale shorter. Actors Kent Cheng and Simon Yam, despite appearing in a less classy production, doesn't hold back on their acting. Kent is very good as the worlds most unlucky Hong Kong man, going through an unbelievable serious of external and internal emotions. 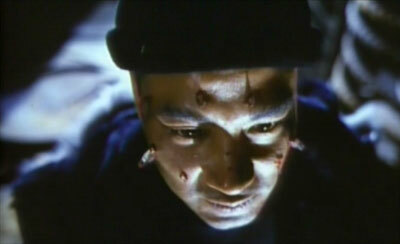 Simon Yam's performance suffers, as mentioned, towards the end because the script dictates that he should act that way. It is one hell of a psychopath he's created for himself though. The character, even early, is a bit of a superhero, not in touch with the reality of the film , but you can't help to get caught up with the fact that he will spare NO ONE his blade, gun or gasoline. Simon goes all out and it's today a memorable villainous performance because of it. Danny Lee, plays Inspector Man (as opposed to his usual Lee, Sir character), phones in his performance. In other words, just going through the motions without much effort. Within the Cat III rated films, Run And Kill is a classic that stands out because it takes on a different structure. It's for the already converted fans mainly and for outsiders, this may be perceived as nothing but a bad exercise in darkness. On the other hand, those serious about film, will see it as solid, I'm sure of that. 2008 EDIT: Now Austria have been blessed woth a remastered, uncut dvd version of this film. To boot it also contains English subtitles. Buy it at D & T (the specs are wrong as it does carry a Cantonese 2.0 track and optional English subs). Kudos to Universe for finally bringing this out on dvd but being a low profile title, according to them, it's a quick, cheap release we've received. In all likelihood, this slightly cropped letterbox transfer, is sourced from the laserdisc and we get a soft, dull looking image that does somehow work fairly well with the mood of the film. The print remains pretty clean throughout but around certain scenes, huge print damage is visible. The original 2.0 mono Cantonese track sounds good though. Dialogue is clear as well as sound effect but overall it could be considered as slightly muffled sounding. A Mandarin 2.0 track is also available. Having owned the vcd, I knew what to expect from the burned in Chinese/English subtitles. Grammar and spelling errors are found in numerous places but the translation doesn't hurt the film. At times, the subs go under the frame a bit and the dreaded white on white syndrome happens a few times as well. Extras are limited to informative Stars Files for actors Kent Cheng, Simon Yam & Danny Lee plus trailers for Memento and Prison On Fire - Preacher.